Whenever I think about technology and Africa, the importance of localization really sticks out in my mind. I harken back to the posts by Ethan Zuckerman and Koranteng Ofusu Amaah to revisit this issue. Ever had problems with images you uploaded to flickr? The first thing I very quickly noticed: somehow all the photos that I uploaded to Yahoo Photos turned out darker than on Flickr (the services both resize uploaded photos). The photo-resizing algorithm used by Yahoo Photos was giving worse results. This was noticeable to me because a large number of photos featured darker-skinned people such as myself. The originals were fine and where there were lighter skin tones everything looked good, but with darker skintones, the resized photos were not so good. Ethan noted that Koranteng found similar problems with Flickr’s flash plug-in and slideshow feature, as well as with Adobe Photoshops Quick Fix and Auto Correct options. Has anything changed since 2005 when Ethan wrote about this? I do not think so, but correct me if i am wrong. Localization matters because cultural sensitivity in technology is paramount to designing products that work as well as possible for all communities. So where are we today in terms of localization of software in Africa? The most successful story that illustrates what opportunities there are in solving African (sw localization) problems with African solutions is that of Ted Kidane of Feedelix. Feedelix is currently providing products that allow SMS editing in Hindi, Chinese and Ethiopic. Software made by an African and now providing products to the world. Another organization to watch and take note of is Kasahorow in Ghana. These guys are doing some incredibly cool stuff. Kasahorow has been working on the Africa keyboards to aid in writing African content, in African languages. They are doing this for all the major operating systems. More info can be found here, including a downloadable package that you can try out. If your main language is Akan, Gaa, Gbe, Hausa, Igbo, Kikuyu, Luo, Swahili, Tswana and Youruba be sure to download that package. There is a firefox add-on that Kasahorow released: Ladies and gentlemen, the Akan Dictionary for Firefox 3.0. Dare I say, cool stuff indeed. Localization matters because it is empowering. Like Jeremy Clarke of Global Voices put it simply: English != Global. The GV Lingua project, translates GV content from English to 15 languages, with Swahili and Polish translations having been added recently. Translations work best when the person has cultural context to allow for expressions in slang and language structures that are difficult to build into machine language. This is another example of localization + aggregation of content. Dare i say again, cool stuff indeed. Another site to keep an eye on is AppAfrica, If i am not mistaken, there will be a project to translate tutorials from English to Swahili on their code repository. On a global level, the ubiquity (firefox) experiment from Mozilla labs seeks to empower users and lusers heh heh to control the web browser with language based instruction. They want to make this available in more than 60 languages. Check it out here, and contribute to it if you can. Watch this clip of Aza Raskin showing how ubiquity works. All in all, in real estate they always say location, location, location…when it comes to African tech i would categorically say localization, localisation, localization. (thank the Brits and Americans for the spelling differences). I would like to hear your thoughts on localization, if you have other examples, and of course more on the mobile web, which I did not touch on on this post. Global Voices had a wonderful meme that I marginally partipated in. I say marginally, because i did not exactly teach someone how to blog, though i added my 2 cents to a question posed about twitter, and was so glad to know that my input was helpful, and even more elated that the person I sorta ‘taught’ how to micro blog is an inspiration to many African women including me. 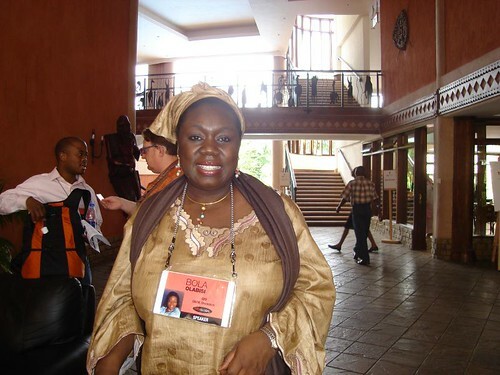 I was fortunate to meet Bola Olabisi of GWIIN (Global Women Inventors & Innovators network) in Long Beach during TED 2009. She is one extraordinary person. If you were at TEDGlobal 2007 in Arusha, you may remember her talk about women entrepreneurs and innovators. If not, click here for my post and here for Ethan Zuckerman’s blogging awesomeness. Hers was a very inspiring talk because she exemplifies action. She saw something that wasnâ€™t being done and just got on with making change happen. To get updated on her organization’s work check out GWIIN. It will have a blog in future. Meanwhile, follow her on twitter. She is http://twitter.com/bola25 Tweeps, please welcome her. This was my brief response, keeping in mind that she has an E71/s60 Nokia phone, and I hope its also helpful to others reading this blog. 4. I have intentionally omitted the section on updating your twitter using SMS because I think that functionality was disabled for countries other than US. 5. You can tie your twitter acct to your facebook account with the app http://apps.facebook.com/twitter/ such that when you update your twitter it updates your FB status too. Happy tweeting…and a belated Happy Valentines! Add more tips in comments. im for showing me around Cape Town. Blogging about the environment is a multi-faceted endeavor, because it is such a broad topic. This was reflected in the concerns brought to the table by bloggers, and when you visit their blogs, you will see that each of them writes about the environment with a different style, and that they have varying concerns. From Green building techniques and green-tech on Carbon Smart, to reviews of eateries and films on Relax with Dax…The South African bloggers have passion for the environment and are part of the ‘green movement’ happening world wide. The question I was asked was, how come the bloggers in South Africa are the most active African writing about the environment? Part of the reason is the digital divide. The internet penetration rate in South Africa is relatively higher compared to other Sub Saharan countries. We have not seen more ‘green bloggers’ emerge in other parts of Africa in as big a way as they have in South Africa (particularly Cape town) I am no social scientist, but I do hope that as internet penetration rates increase in Africa, that we have more people writing about issues relating to the environment. We discussed the business of blogging briefly, particularly whether to accept advertising on your site, particularly whether you can do this effectively without compromising your ‘voice’. For example if you do not condone the actions of a multinational company, yet when you have google ads, their ad could appear on your site. How do you manage that effectively? This remained an open question, though Wanda of UrbanSprout suggested having control over which ads can appear on your site with whichever method of ad service you pick. Another issue was brought up by Rafaela of greenflavour, about using blogs for environmental activism. The resulting actions such as cease and desist letters from companies that try to sue you for stating an opinion. I did mention Eff.org as a resource, and checking the Berkman Center for Internet and Society on guidance in terms of law and free speech online. Rory of Carbonsmart challenged all of us that we need to show transformation, to show that the environmental movement is happening, and that people are thinking about their impact on the environment and doing something about it. To this end, Rory has began a mapping project called ‘Greening Africa’. The map was mentioned on an earlier post on GV enviro. Glen of Urbansprout is considering creating a map of the information contained in the exhaustive directory of green businesses. He and Wanda created the directory from scratch and it is currently part of the Urbansprout site. It is a good resource for the many football fans flocking to South Africa in 2010 for the the world cup. Do bookmark Greenstay.co.za, as he gets this project together. There were so many other great conversations, but the consensus was that this was the first of many such gatherings for bloggers who share a concern for the environment to meet, exchange ideas and collaborate on various initiatives. I would like to thank each and every one of the bloggers who attended. I hope that this is but the beginning of many more meetups. I left encouraged, and inspired by the environment bloggers of the Mother City. Links to their blogs are listed here (in no particular order). Update: One more link…Ian ‘GreenMan’, I have been reading his blog for years and can’t believe I forgot to include a link. The wiki is available for future meetups and as always if there is a blogger interested in joining the Global voices team for enviro-bloggers, please let me know. Pictures of Capetown are posted on the flickr set ‘I love Capetown’. 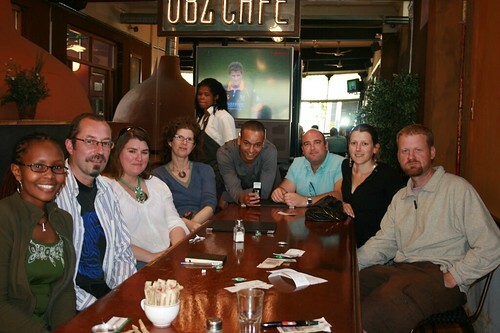 Thanks again to the enviro-bloggers in South Africa for their time and for their hospitality. A Macbook Sleeve You Should Buy. When I attended the GV summit I counted myself quite lucky to meet so many bloggers from around the world, including contributors to Global voices online. 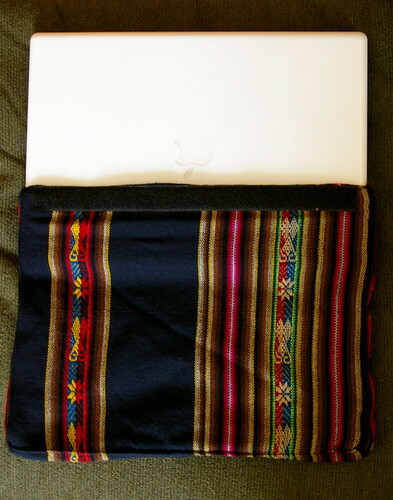 The gift of a macbook sleeve from Bolivian project ‘Voces Bolivianas’ was one of the many highlights of the summit. It was such a moving gesture that some of us were fighting back tears of appreciation. You see, the Global voices logo was hand-stitched onto the sleeve, and Eduardo and his team lugged this big huge bag all the way from Bolivia to give each one of us a choice between the 15″ sleeve and the smaller 13″ sleeve. The sleeve is lovely, it is made from traditional Aguayo textile, and I have to admit I treasure mine a whole lot. You can buy one for yourself, and in the process, help support a very worthwhile project that is reaching out to underrepresented groups in Bolivia, getting them to share their opinions online through the use of blogs and other participatory media. The colors are just lovely…get one! I am at the Global Voices summit, regarding citizen media, democracy and technology. Citizen media allow for more active and open participation in political processes, but threats of censorship and oppression discourage citizens from expressing their own opinions. This session will present case studies from Kenya, Iran, Egypt, Morocco, Singapore, and Hong Kong. The tools to circumvent web filtering and other methods of online censorship exist, but they donâ? ?t always reach the people who need them as easily as they could. How can we facilitate better coordination between the developers of these tools and the anti-censorship activists that need them? And how do we facilitate the flow of feedback from the activists back to the developers so the latter can design more appropriate tools? The rise of blogging, social networking and micro-blogging services like Facebook and Twitter, video- and photo-sharing sites like YouTube and Flickr, and the spread of mobile technology have given ordinary citizens the means, at least potentially, to participate more fully in the democratic process. This session looks at the impact these tools have had on recent elections in Kenya, Venezuela, Armenia and Iran and poses the question: is citizen media having an actual impact on democracies in transition? For December 8th there is a plan for a climate parade in Nairobi. If you will be attending or have more information, please feel free to comment. I would love to see photos and if you are a Kenyan blogger attending the parade please give me a heads up whenever you write about it. Thank you! From KenyanPoet, The Climate change Orchestra will be playing as part of the WAPI event at the British Council. More details here. For the Africa online crew there is something for you, you can join the Virtual Rally on the same day Dec 8th by writing about climate change. You do not have to alter the tone of your ‘blog voice’, a quip, a video, a rant, your thoughts… You can also sign a petition here. At global voices online, we have a special page with links to blogs covering Bali and Climate Change politics, so do check it out. I have been going through the feeds to keep it fresh just for you, so do not miss out on the river of news coming out of Bali. If you are an African blogger writing about the environment, this is the week to do it, Global voices links will show up on the Reuters page. How is that for getting your voice heard! * If you donâ? ?t raise your voice, then your environmentalism means nothing; itâ? ?s mere tokenism or opportunism. * The environment is very important in the aspects of peace because when we destroy our resources, they become scarce and we fight over that. * We have a special responsibility to the ecosystem of this planet. In making sure that other species survive we will be ensuring the survival of our own. Nuru Nyambura on One Maker Space Per Village?